Thanks for sticking with me while I recap my Europe trip from the winter. It’s like Christmas in July – along with dreary gray photos! 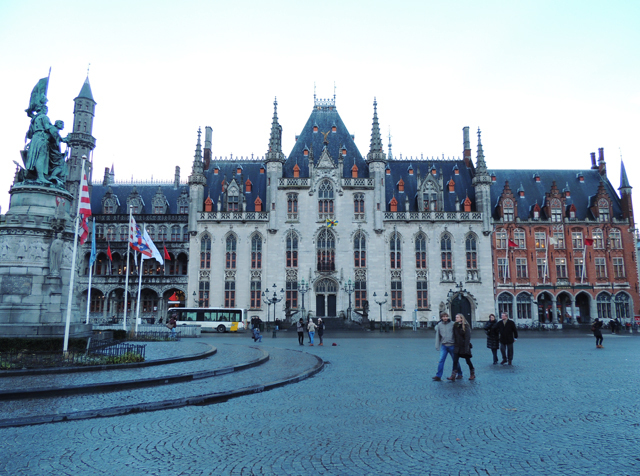 We had enough time for a stop-off between Brussels and Amsterdam and we settled on Bruges because it looked absolutely gorgeous and was easily accessible by train. To those who want to go this route, Ghent and Rotterdam are also good options, but I’m so glad we chose Bruges! Bruges is in northwest Belgium and is the capital of West Flanders, the Flemish region of the country. Accordingly, the language spoken is Dutch. Like Brussels, Bruges is known for its frites, a high concentration of chocolate shops, and lace. I brought back a beautiful piece for my mom, who loves to sew and can appreciate high-quality fabrics. A perfectly preserved medieval city, Bruges is has numerous canals, cobblestone streets, and ornate old buildings. It’s also a small city and very doable in two to three days. Since we went in the winter, tourists were at a minimum and we almost had this fairytale city and all of its beautiful attractions to ourselves. However, it is the most popular city in Belgium and the summer is filled with hordes of travelers. If you are coming in high season, be sure to plan accordingly. Here in America, we have a different concept of “old.” Clothes made in the eighteenth century are old. Plantations are old. The Freedom Trail in Boston is old. However, my perspective on history changes completely when I visit Europe because these cities are for real OLD. 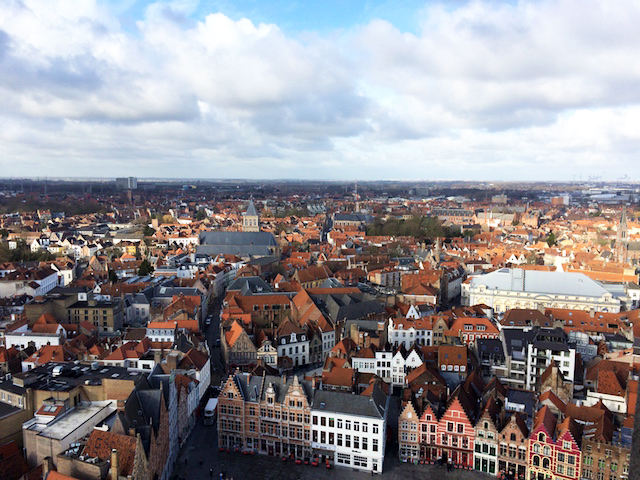 The history of Bruges not only stretches as far back as the 9th century, it’s also fascinating. Bruges as we know it started out as a 9th century fortress built by Baldwin I, Count of Flanders, to protect against Viking attacks. Bruges’s Golden Age lasted from the 12th to 15th centuries, as it became a strategic location at the crossroads of two main trade routes. The main good that was traded was cloth. The canals, layout, and buildings are gorgeous and historic, and you’ll want your camera out the whole time. 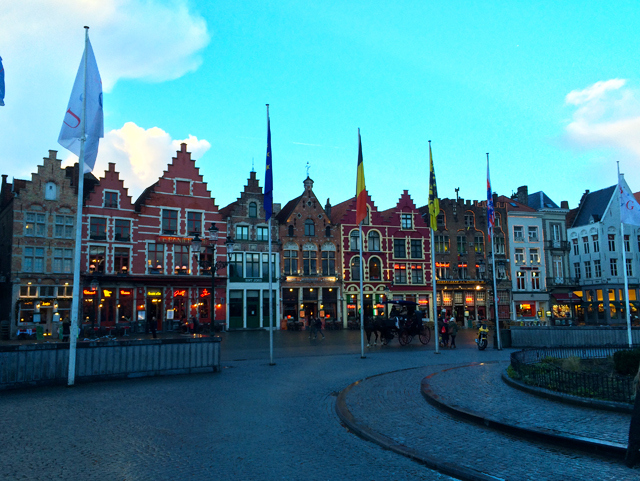 In the heart of Bruges, the Markt is the picturesque main square of the city. Gabled buildings and horse-drawn buggies line three sides of the square, with the Belfry on the fourth. A monument to craft artisans sits in the middle. The city’s other main square, the Burg is just as picturesque. The Heilig Bloed Basiliek (Basilica of the Holy Blood) sits on the right side of the square and contains one of the holiest relics of medieval Europe. 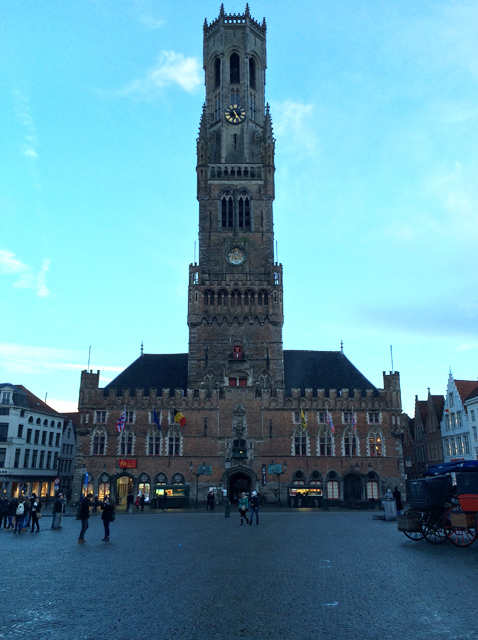 A medieval bell tower in the Markt, the Belfry has 366 steps to the top, giving visitors gorgeous panoramic views of the city and surrounding area. The Belfry was built in 1240(!) with upper sections added in the 1400’s. Its carillon consists of 47 bells that play throughout the day. A must-see in Bruges! This museum features early Flemish paintings, including great works by Jan van Eyck and Jan Provoost. The museum contains van Eyck’s famous painting, Virgin and Child with Canon van der Paele. I really enjoyed this! 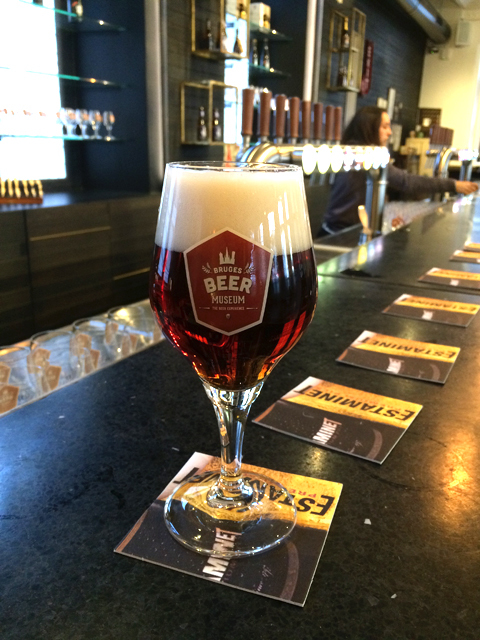 A relatively new attraction, the Bruges Beer Museum guides visitors through the history of beer making in Belgium. Did you know that beer was safer to drink than water in medieval Europe due to the boiling and distillation process? The price of admission includes a tasting, and their tasting room does not disappoint – it’s a large, stylish space with plenty of beer choices. A canal tour is a great way to explore the city and learn some history about the area. Unfortunately, the weather was quite poor on our trip but I wish I had gotten to do this. Multiple tour companies run daily heritage tours. 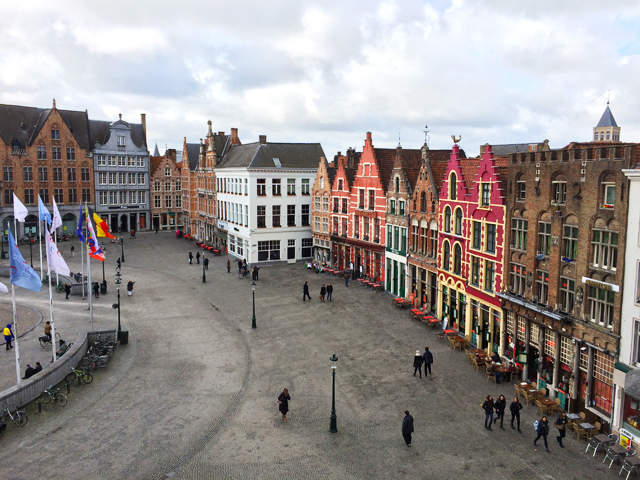 Bruges is a foodie city and there is a plethora of top-tier restaurants and bars. We had a great time at Est Winjbar, a popular wine bar with live music on Sunday nights. Other eateries include De Halve Maan (Straffe Hendrik) Brewery, Café Rose Red, and Reliva Restaurant. 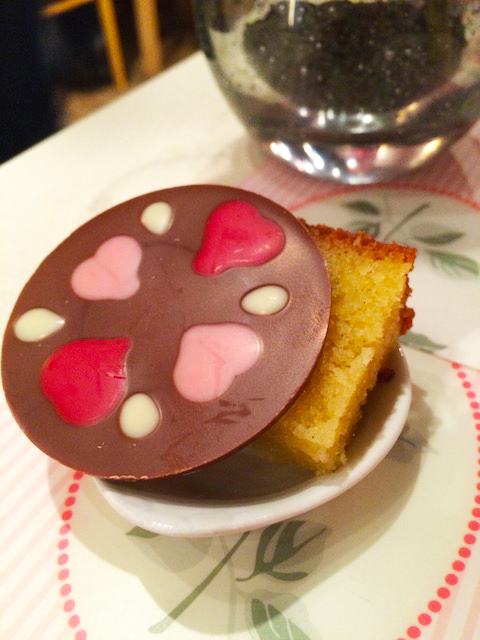 A quick note – we stayed in an Air B&B and had a great experience. For the same price as a hotel, we had a two bedroom apartment to ourselves, along with a full kitchen, spacious living room, and roof deck with gorgeous views of the city. We also had wonderfully friendly hosts who provided a plethora of information about the city. Don’t be afraid to check around for alternate accomodations! 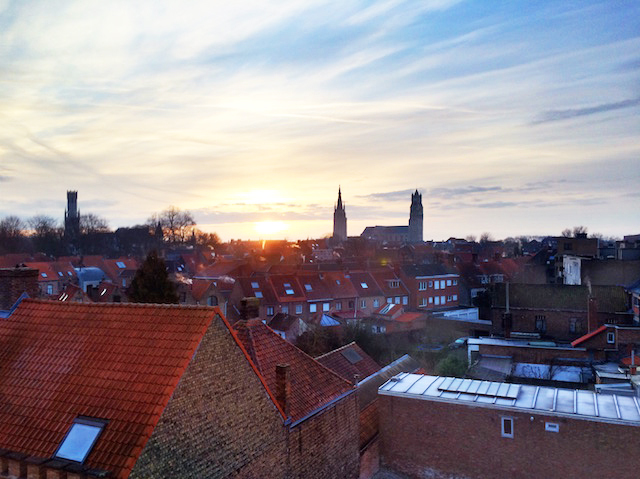 Here is the NYT’s 36 hours in Bruges guide. 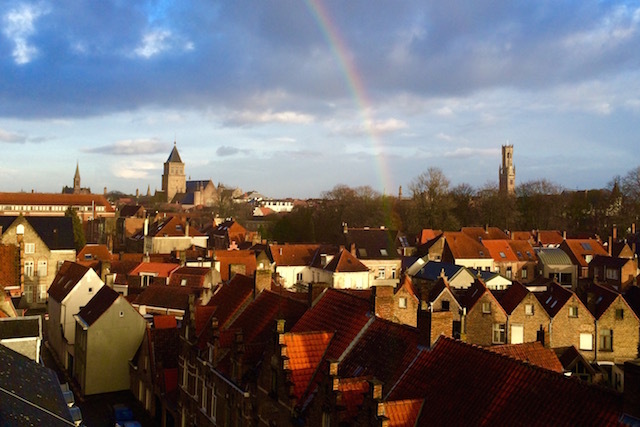 Read more about Bruges’s history in the UNESCO World Heritage Center.